Product prices and availability are accurate as of 2019-02-26 23:50:22 UTC and are subject to change. Any price and availability information displayed on http://www.amazon.com/ at the time of purchase will apply to the purchase of this product. 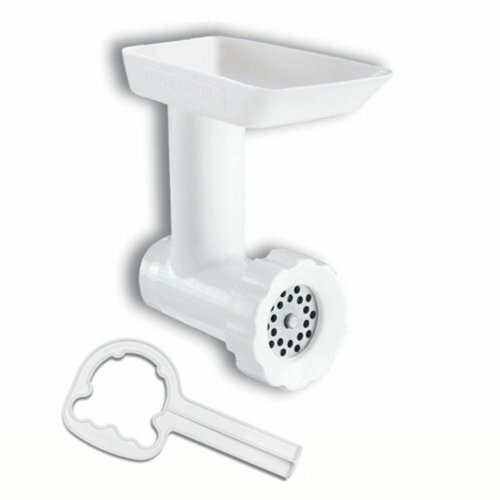 Make your KitchenAid stand mixer more versatile with this white KitchenAid food grinder attachment. Easy to assemble, attach and clean, it comes with fine and coarse plates, a stomper and a wrench. Fine plate grinds raw or cooked meat for spreads, as well as fresh or dried bread for crumbs. Coarse plate grinds raw or cooked meat, firm vegetables, dried fruits and cheese. Made in USA. This tool increases the fun factor of your KitchenAid stand mixer several times over. Toss cubes of meat into the food tray, stomp 'em down, and watch the results wriggle out the front. Grind your own beef or chicken for patties or tacos. Blend your own sausage mixtures, from breakfast to boudin blanc. With additional attachments, you can turn it into a pasta maker or a sausage stuffer. It's easy to assemble and use. Most parts are dishwasher-safe; hand wash the grinding blades, food stomper, and cutting knife. Impress your brunch guests and treat your family to healthful and delicious homemade sausages with this sausage stuffer attachment by KitchenAid. 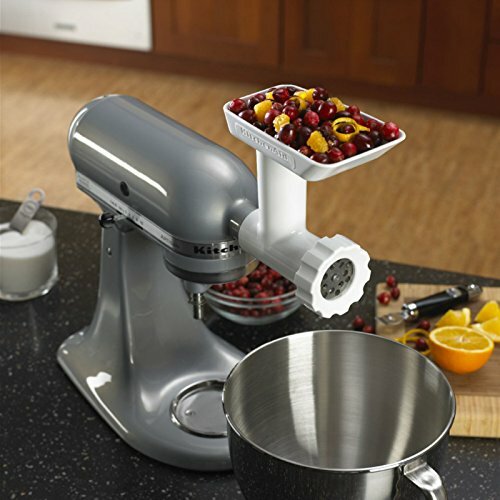 Designed to work with the food grinder attachment for stand mixers, it makes small or large links quickly and easily. Dishwasher safe. Made in USA. 5Hx2" dia. Amazon.com Use these lightweight plastic tubes to stuff your home-ground meats into natural casings for hand-made sausages. The small tube shoots out breakfast-sausage-size links; the larger one is great for boudin blanc, Italian sausage, and more. 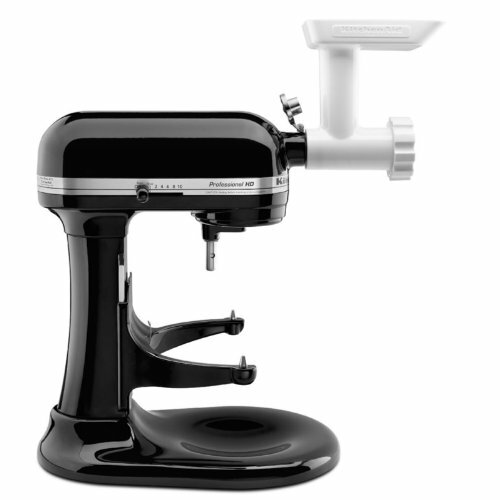 Each works in conjunction with KitchenAid's food grinder attachment, and the set comes with instructions for handling and stuffing casings. Tubes are dishwasher-safe.